You will design and paint your own unique embroidery foundation. 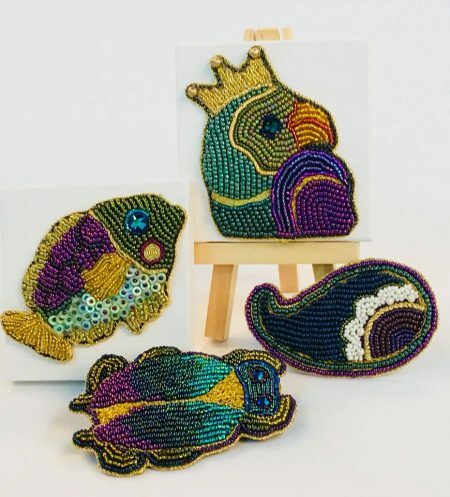 After lunch, bead embroidery stitches and gold works stitches will be taught and explored. How to design and transfer designs to Lacy’s stiff stuff; how to use acrylic paint on foundation; multiple bead embroidery stitches; the use of gold work threads and metals will be incorporated into designs; finishing techniques to either make design into a pin or Amulet bag. 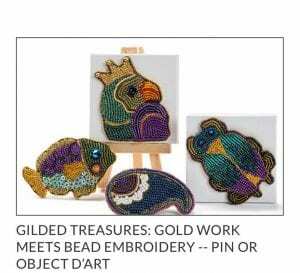 Painted design of your choice, real gold thread and backing. 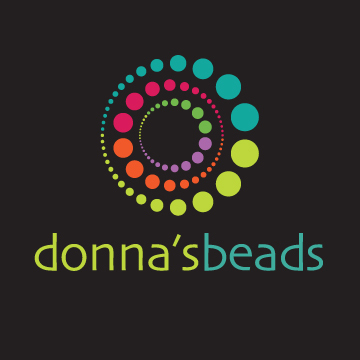 Students must purchase seed beads, accent beads, fireline, needles and bead mat separate.